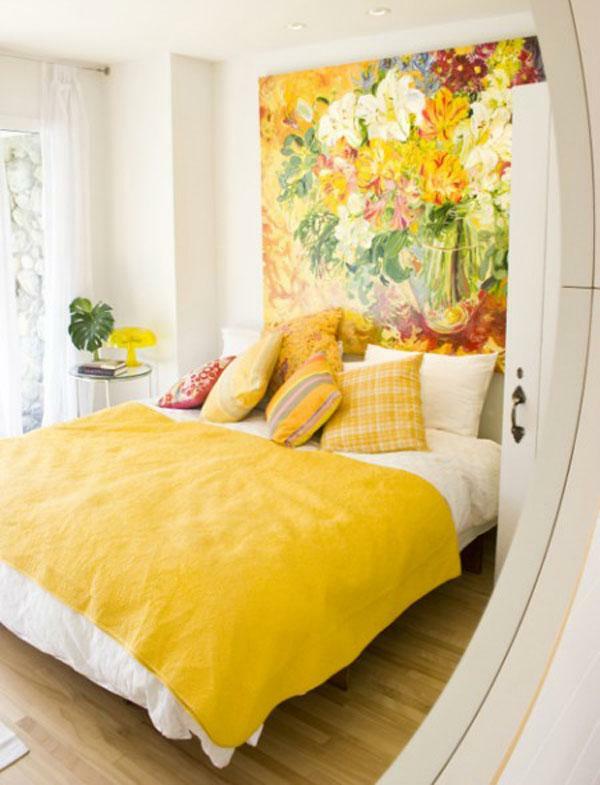 Floral inspired headboard. This headboard design gives out a very festive vibe with all the bright colors and also with its size. 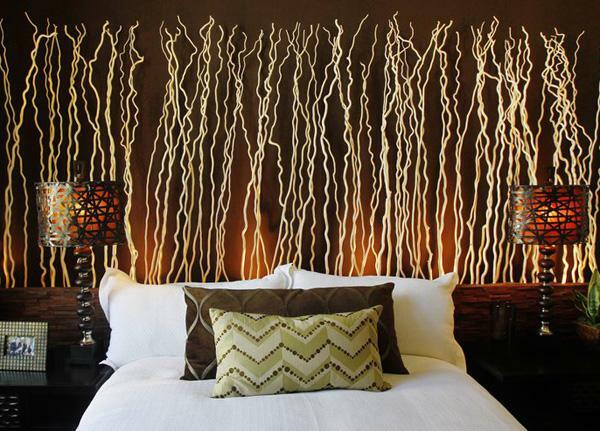 It functions both as a headboard and as a decoration on the wall. Planning on getting a headboard for your bed? If yo are then there are a lot of choices that you can pick out from. First off, you should know why you would want a headboard for your bed and what advantages it can give you. There as also many beds that don’t have headboards which can make you question why you would need one in the first place. The key factor is the use of it and what you can get out of it compared to a bed not having a headboard at all. A headboard is a piece of furniture that you can see on the head of the bed; it is usually attached to the head of the bed and can vary in style and size. You can even find creative headboards that give you more functions and have more features, depending on the style which the headboard is going for. Before, headboards were used as a board that separates the head of a person with the cold wall during sleep. This helps keep the draft off the walls and making the person sleeping feel more comfortable. The headboard also allows a small space between the bed and the wall where the cold air is able to sink in and onto the floor. When the bed is pushed on the wall ten this would defeat the purpose since the cold will be settling on the bed instead. The main material that is popularly used for headboards is wood because of how it is able to become less cool compared to bricks or even stones. Then again through the modern times, there have been a lot of innovations with beds that it no longer requires them to have headboards. On another note, there are also some people who still prefer headboards because of its classic look and its aesthetic design which makes a room really homey. Nowadays houses are made to be better heated than before and this makes the use of the headboards not as necessary as before. Then again it did not disappear entirely from the construction of the beds as now it serves a new function. The headboards nowadays hold the pillows on the bed or the linens. Now, it can also be used as a storage space or even function as a bookshelf for book lovers who love reading right before sleeping. There are also a lot of other activities that you can use your headboard with. They can be used as support for the back when you are sitting up on the bed and reading a book or watching a movie. You can also lean on them when you simply feel like resting your back on the hardwood and not on the pillows or on the mattress. Many also make use of the headboard as storage places. You can store small things there such as your alarm clock, books, cups, toys, plushies and so on. In some other cases, people also put a spragging board on the foot of their beds so that their feet can rest or they can also be used for storage as well. Even though there can be many uses for headboards, you can still have them simply for their design. They have aesthetic charm that can give the room life and style; they are always the favorite of interior designers. You can get headboards in different colors and they can also be made out of various materials. This is why you can often see headboards that can be styled differently, painted differently and most of all constructed differently. You can go with upholstered headboards as well since they can be very comfortable especially for book lovers. You can choose just about any type of headboard, just make sure that you are comfortable in using them. You can find headboards in different designs such as the classic square design that you can see form previous headboards. However nowadays there are other shapes for headboards such as those with round corners and arches. There are also headboards that are designed in wicker and look like they have been tied together and leaving space in between to make it look even more unique. You don’t have to worry about the headboard sizes because they can fit the single, twin, queen, full, California king and king sizes. That’s why you can be free in looking or the best headboard design that you can get for your room. The choices are wide and you can basically be free of what you want it to look like. If you haven’t tried a headboard before and you’re redecorating your room, this can be the perfect chance for you to try something that you haven’t before. You can easily look for headboard designs online so that they can give you an idea of what you might want. You can also check out furniture websites and see what is the most popular or well-liked headboard nowadays. Depending on how personalized or customized you want your headboard to be, you can have them constructed or you can buy ready-made ones. 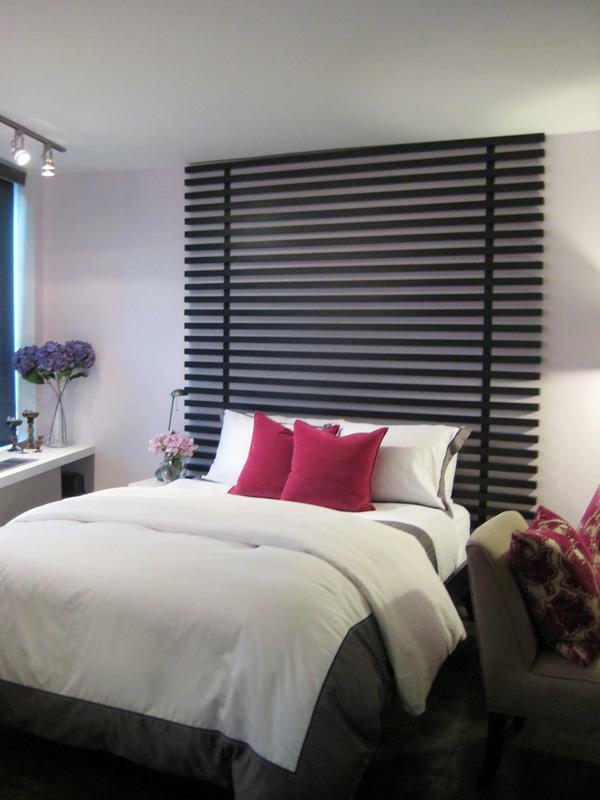 Don’t Hesitate To Try Headboards! Getting a headboard is all about your preference, it doesn’t mean that you necessarily need to get one and it doesn’t mean that it is useless either; the final decision is always up to you and how much you want the headboard for your room. When you want a full metal frame for your headboard, you should try getting a larger duvet that can cover the frame and reach the ground. It will be easier to look at sample pictures online so that you can get a hint or a wave of inspiration on what would be the perfect headboard for you. 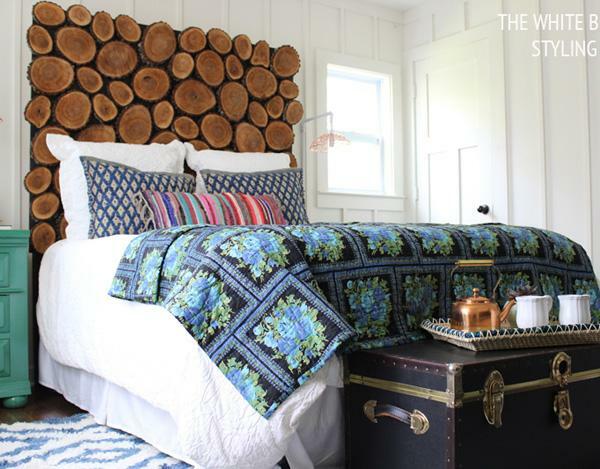 Beautiful wooden headboard. 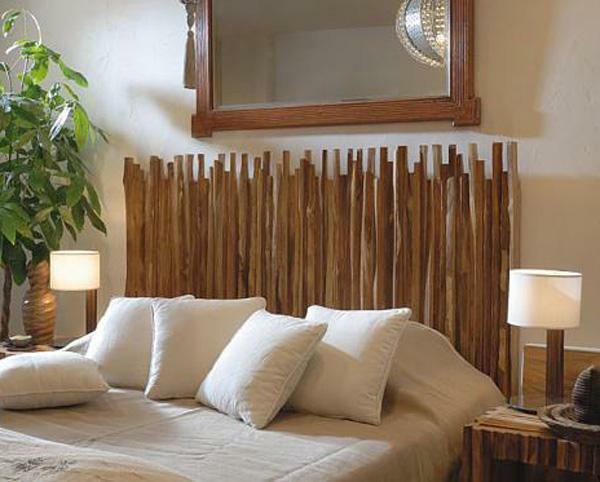 Made out of wood, this modern designed headboard is directly attached to the wall and connected to the top of the bed. It looks neat and at the same time refreshing. 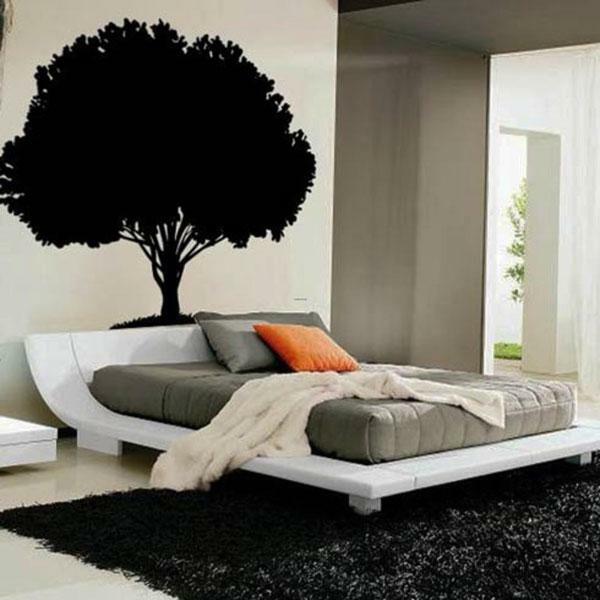 Garden inspired headboard. 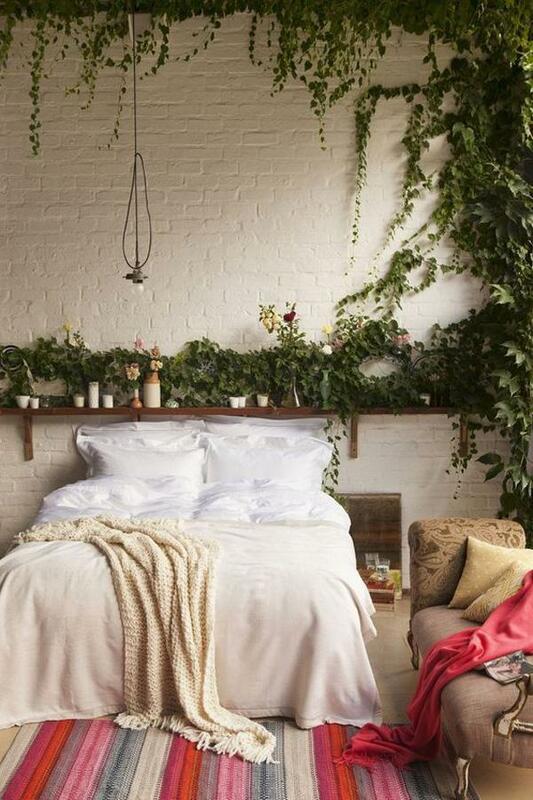 The entire room is decorated with flowers and vines and the headboard serves as the table holding the plants in display. 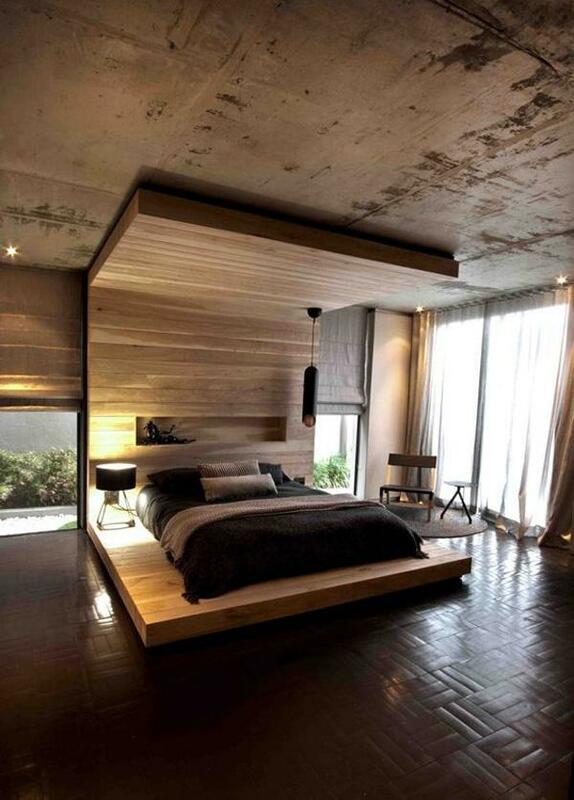 Amazing full headboard. 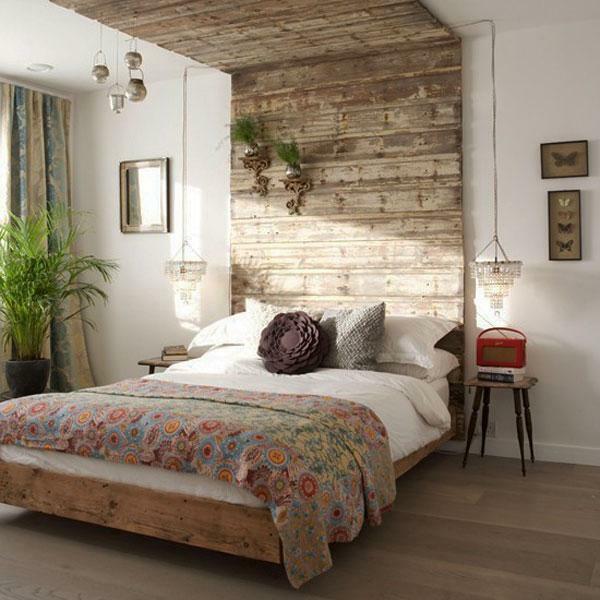 This headboard is made out of wood and extends to the foot and the ceiling of the bed. It gives a cozy and secure look to the room and is perfect for those who are also looking for a place where they can rest their feet. Flower inspired headboard. The black and white themed headboard is designed with white knitted shapes that form into a large flower and it looks absolutely perfect for the room. 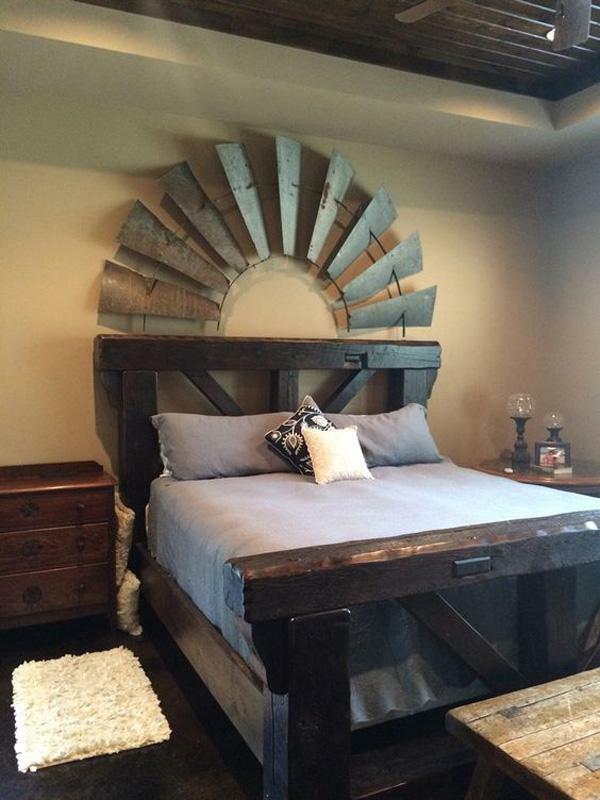 Windmill themed headboard. 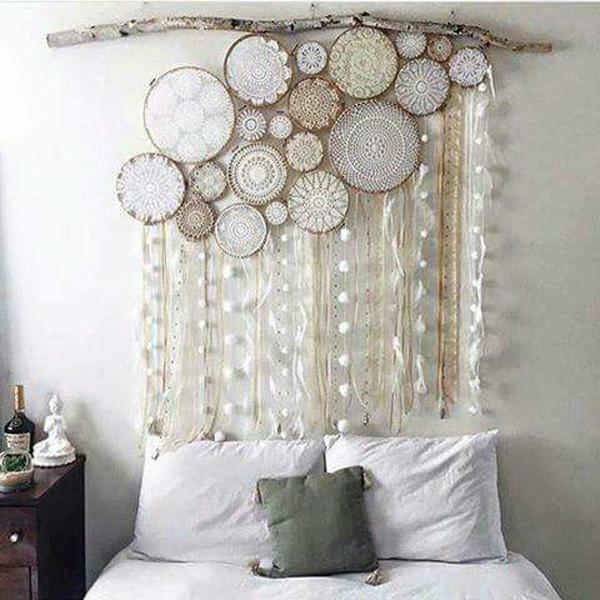 If you are fond of windmills then this might be the perfect headboard for you, it looks unique, fun and classic. Bookshelf headboard. Just about any book lover’s dream. It is cute, sweet looking and multi-functional. Perfect for those who want a good read before sleeping. Mattress themed headboard. Sometimes the headboards can also be soft and cushiony. 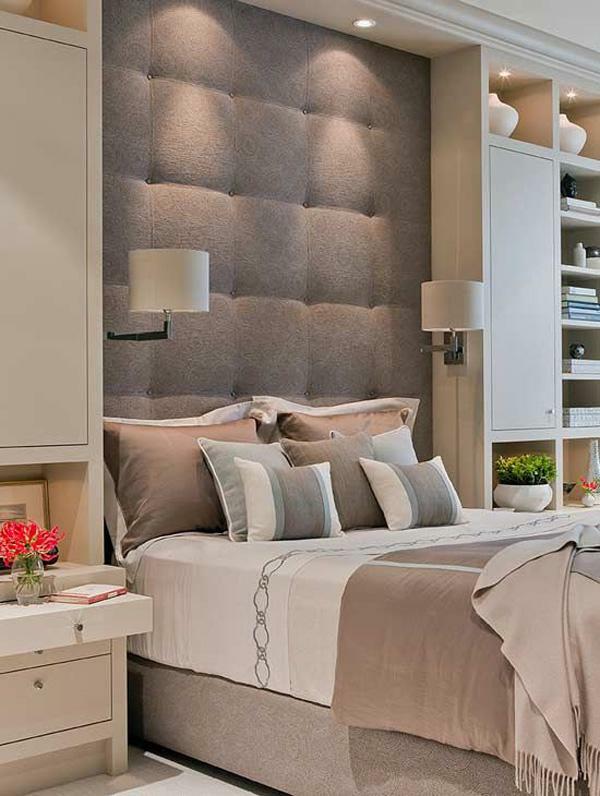 This modern headboard design is perfect for giving the room a soft look. 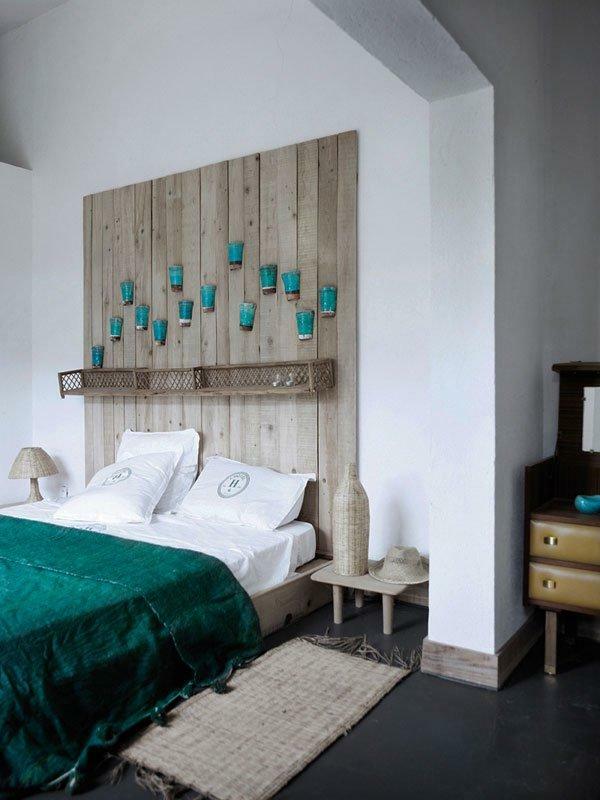 Wooden headboard with pots. A perfect headboard when you like the feel of the country. The hanging pots also look like they are perfect places for young flowers to grow. Beautiful classic headboard. Designed for a princess, the intricate styles n the headboard make it look like it came out of a fairy tale book. 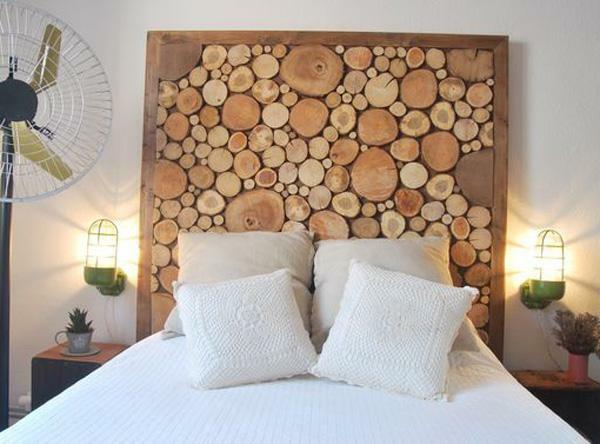 Headboard design made out of wood. The way that the wood has been cut make a perfect design against the wooden flat board behind it. A cute ye warm looking design. 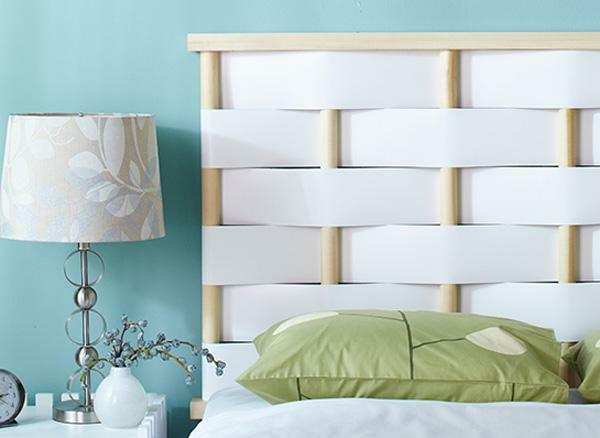 A beautiful and refreshing headboard design. The combination of cloth and wood go perfectly and make the bed look even more comfortable. 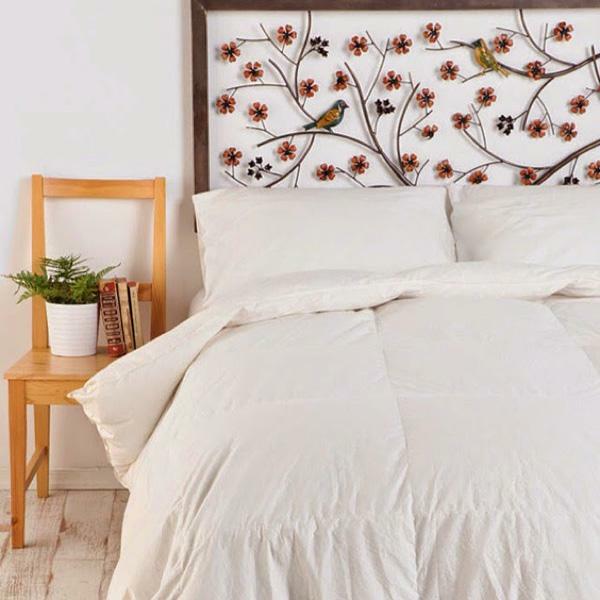 Frame inspired headboard with flowers and birds. The wide headboard is also made into a frame where you can design whatever you want in the middle of it. Pillow explosion headboard. There is a group of pillows arranged differently and in various sizes making it look even more comfortable and definitely homey. Cushion filled headboard. This type of design helps make the room look more comfortable and not only that but leaning onto the headboard also makes it feel softer. A light wooden headboard. A wonderful combination of a headboard and a lamp. Great when you want to have low lighting when you go to sleep. 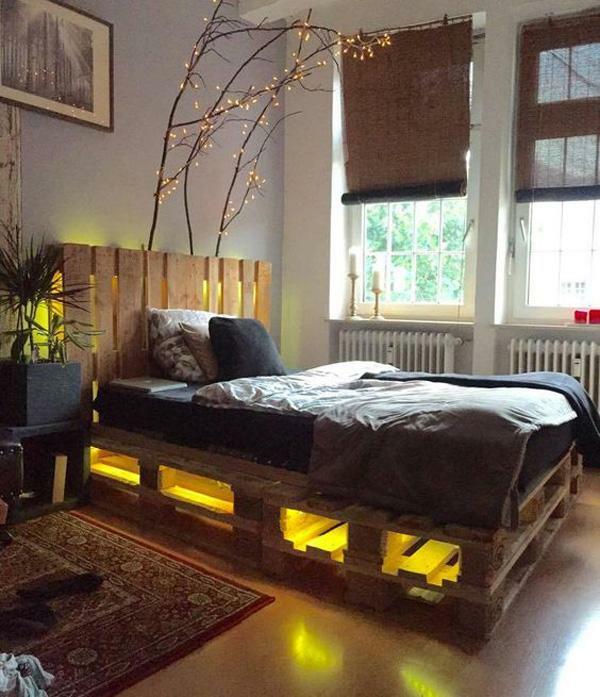 Wooden headboard with lights. 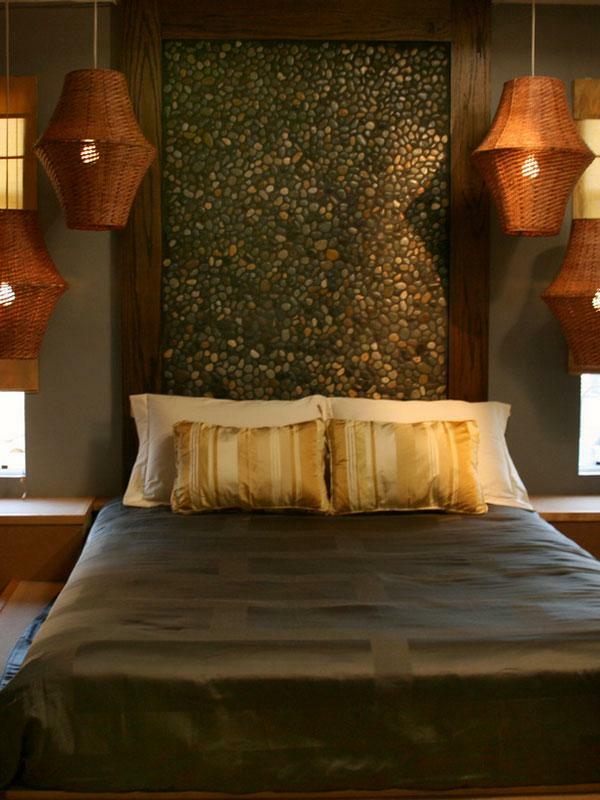 A really modern looking headboard design that also gives a natural vibe from the earth colors. 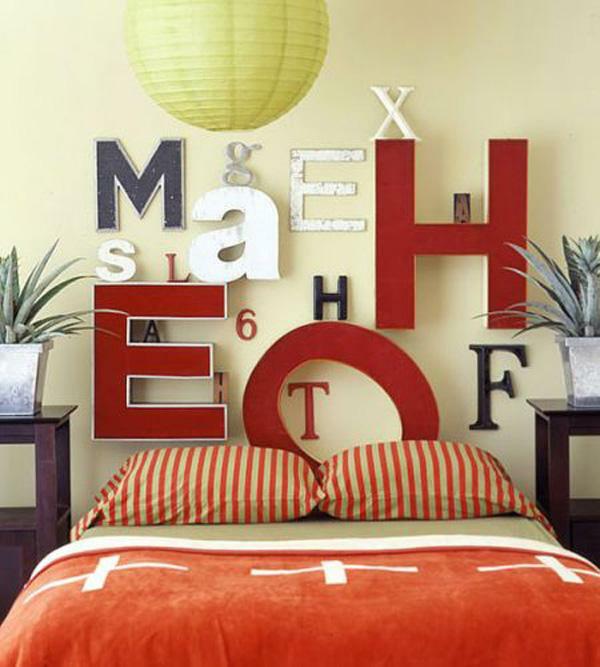 Modern typography inspired headboard design. This designs looks very spacious and the large and small letters grouped to contrast makes a good combination which can easily be personalized as well. 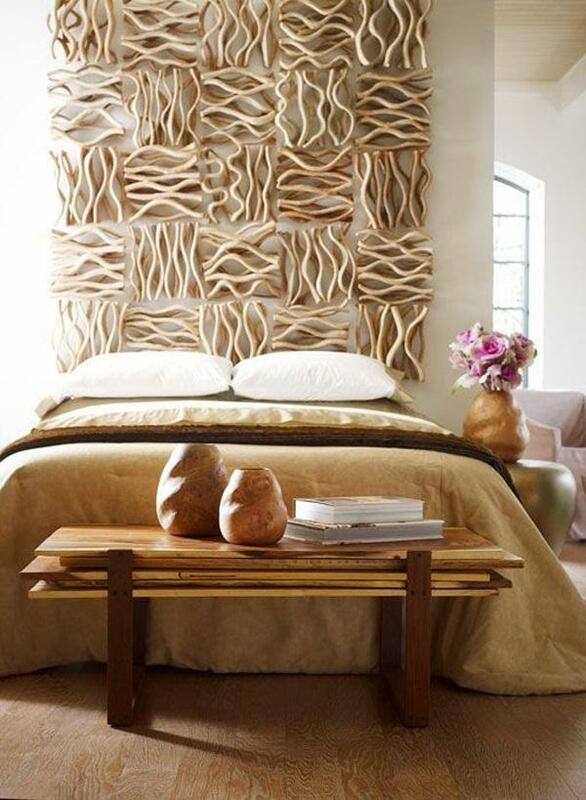 Beautiful and sleek looking wooden headboard. Thea headboard then extends onto the ceiling with the low light and at the same time provides space where books can be stored. 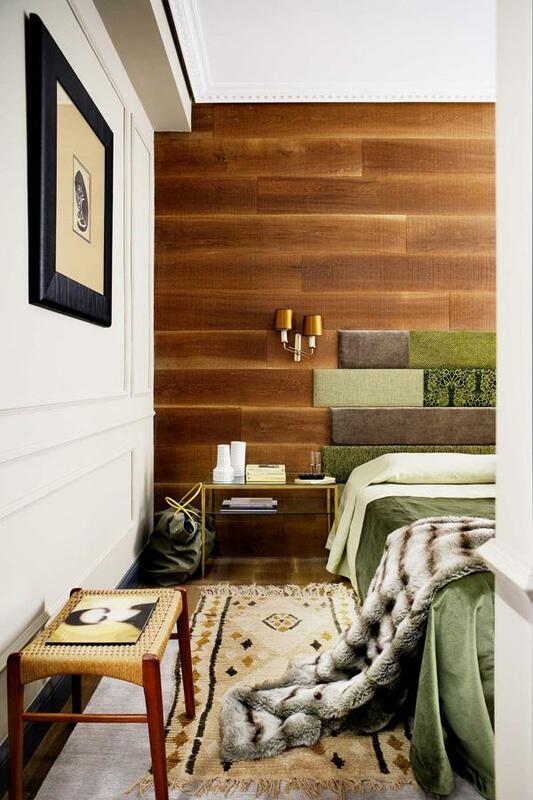 Modern sloping headboard. This type of headboard is perfect for those who want the feeling of having a headboard yet don’t want it to show so visibly. 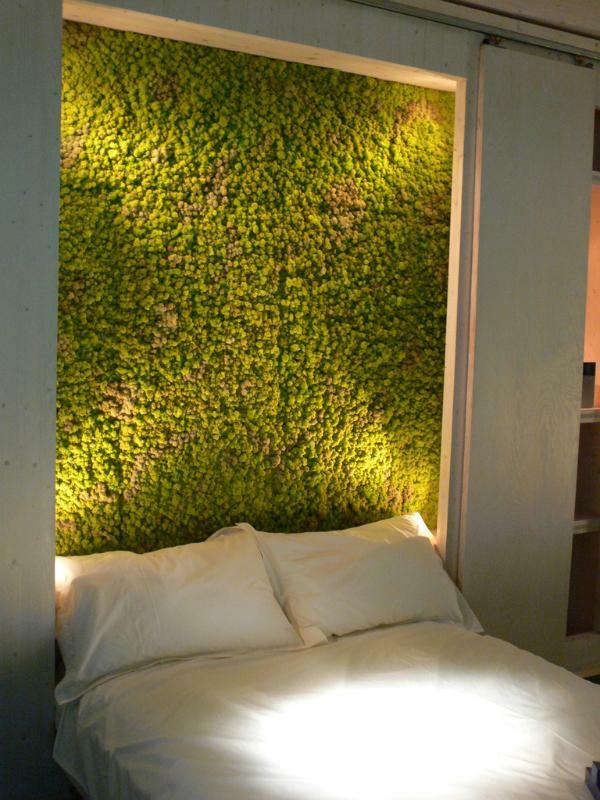 Moss themed headboard. This quirky yet interesting looking headboard features moss like objects with fixed lighting and giving a feel of freshness and calmness in the atmosphere. Night sky inspired headboard. The headboard extends upwards where it holds designs of different sizes of stars. 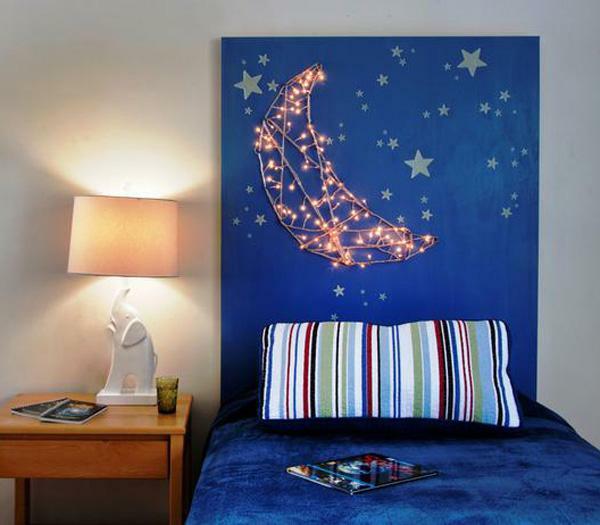 There is also a group of lights affixed on the headboard forming a moon. Steam punk themed headboard. The presence of the various wheel-like objects grouped together make sa beautiful and elegant steam punk look on the design. 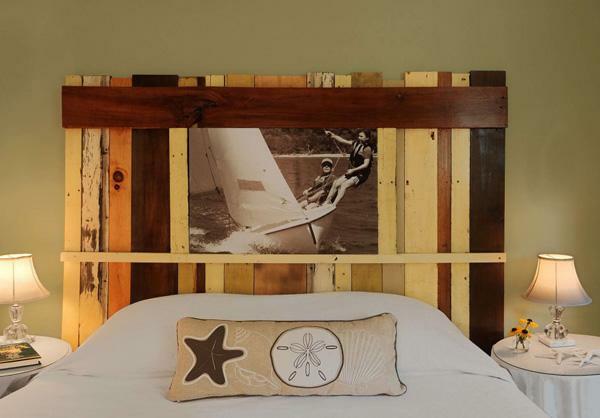 Oar inspired headboard. Do you love boating? 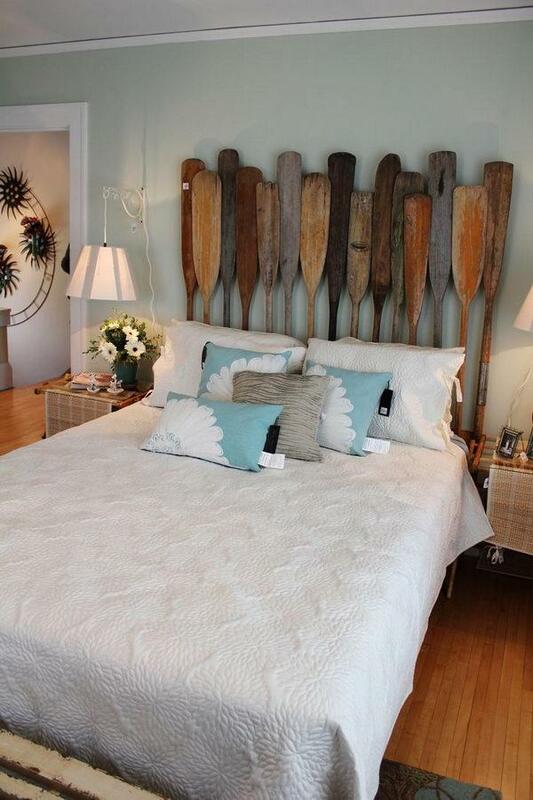 If you do then you don’t need to throw away old oars and you can use them as customized headboards instead. Picture frame headboard. Who says that pictures can only hang on the wall? 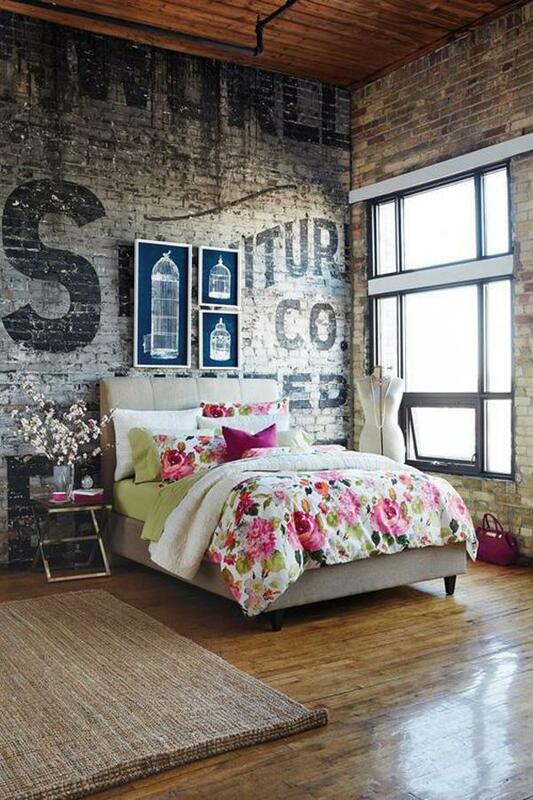 Get creative like this design where the wooden headboard also functions as a large picture frame. Pillow headboard. 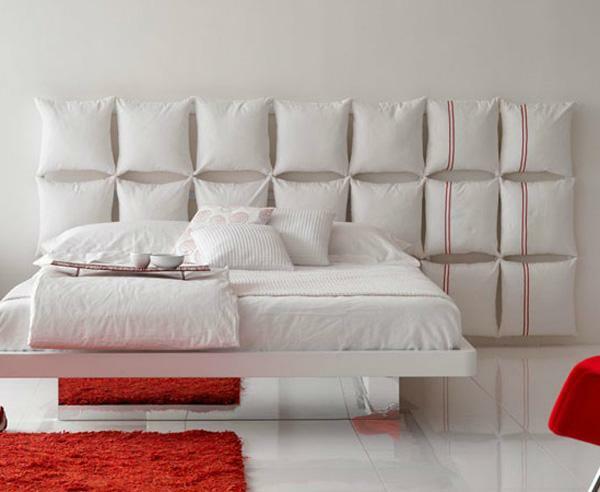 As if headboards weren’t creative enough, check out this headboard filled with nothing else but pillows. Blinds inspired headboard. The successive bars on the headboard give it an impression of being wide and pleasant. 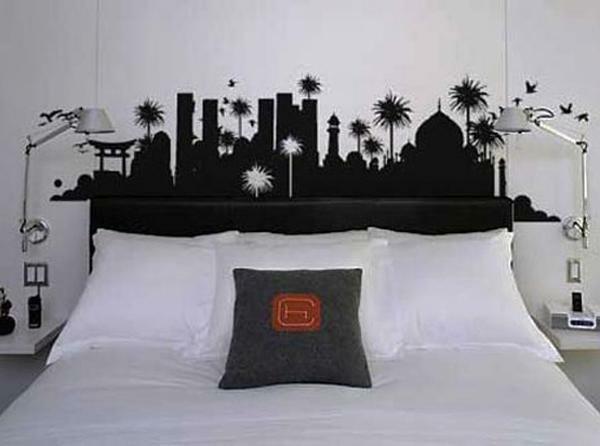 The design also helps make the bedroom look spacious and clean. 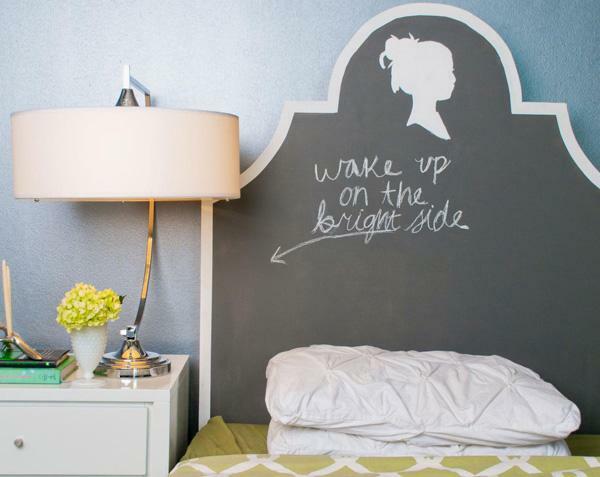 Cute wake-up headboard. This is rather a simple shaped headboard yet it is customized beautifully with a witty saying and some symbols to complete the thought. Old western door themed headboard. If you’re a fan of the wild wild west, then this could be a perfect type of design for your headboard. This can also help you save especially if you already have those old lying around the garage. Elegant mosaic themed headboard. The mosaic is then held together by a wooden frame which completes the look and gives a really classy vibe to the room. Wooden headboard with a frame. The design looks like a group of chopped wood has been compiled together to fit the wooden frame and they all look absolutely pretty. 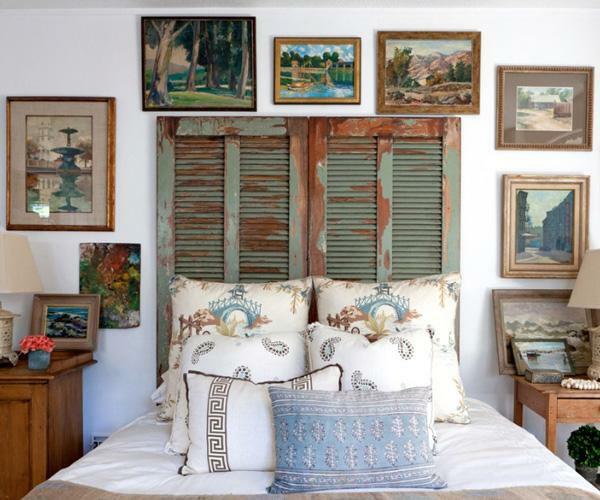 A really beautiful location inspired headboard. The silhouette effect on the headboard gives the design intrigue and mystery to keep you guessing where it could possibly be. 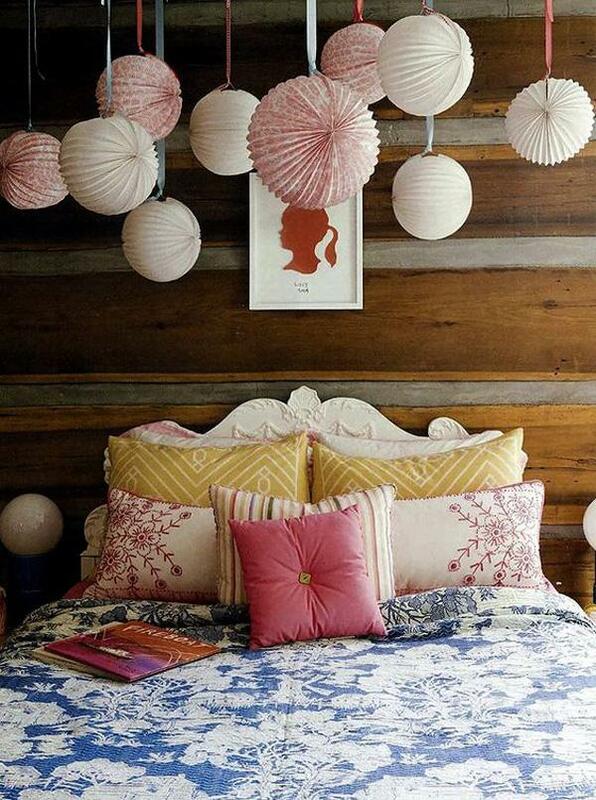 Country inspired wooden headboard. 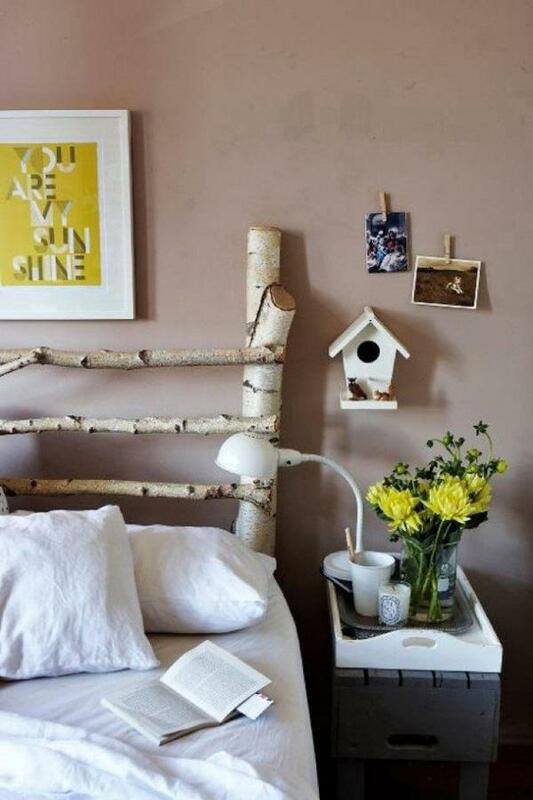 Probably one of the easiest types of headboards that you can simply collect and paint on to get the rustic effect. Brick themed headboard. Ever wanted to feel how it was like sleeping with brick walls? This classic and cute looking headboard design can help you get the right atmosphere. Beautiful random headboard panels. 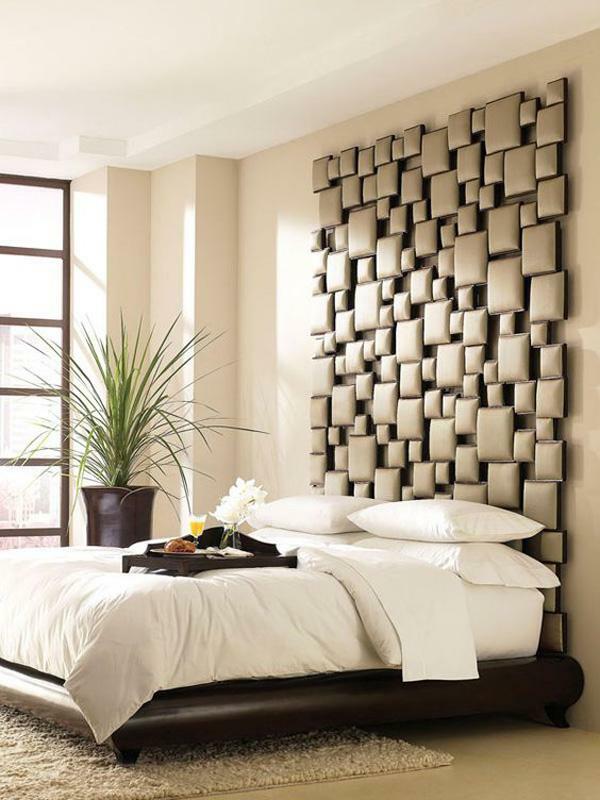 A modern looking headboard design where various panels are combined to create a modernistic style. Wooden headboard combined together to form a fence like structure. It looks simple yet gives a very nostalgic effect. 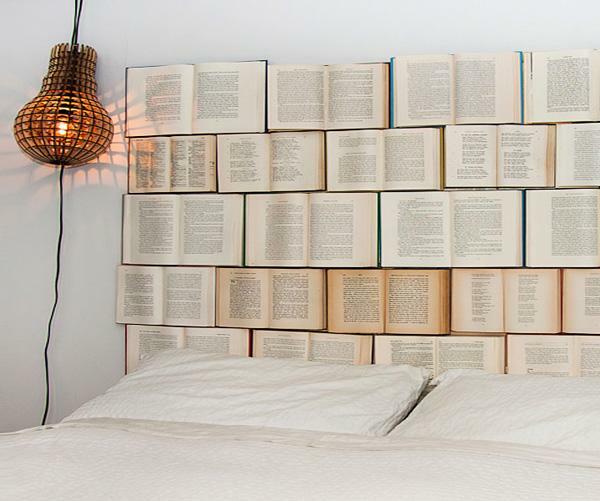 A very artistic headboard made out of books. 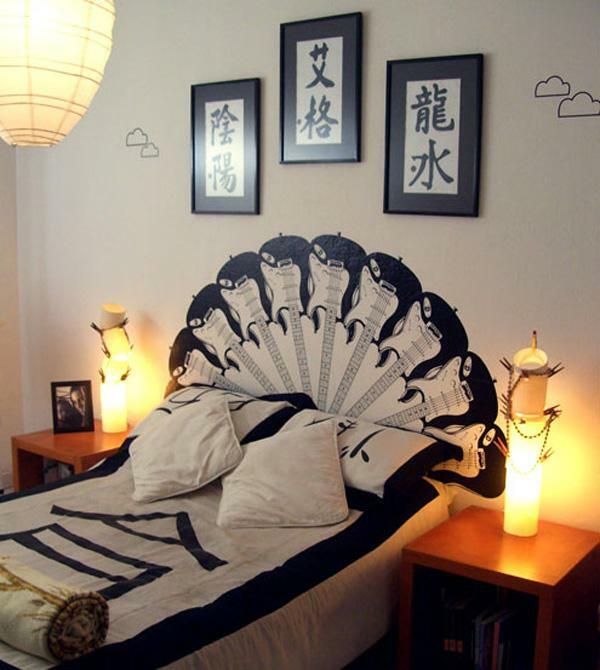 If you are a book lover then this would be one of the best headboards that you could ever have. Interesting looking and definitely perfect for bookworms. A really cute bookshelf headboard. The entire bed is attached to a bookshelf that holds all the books for easy access when reading on the bed. 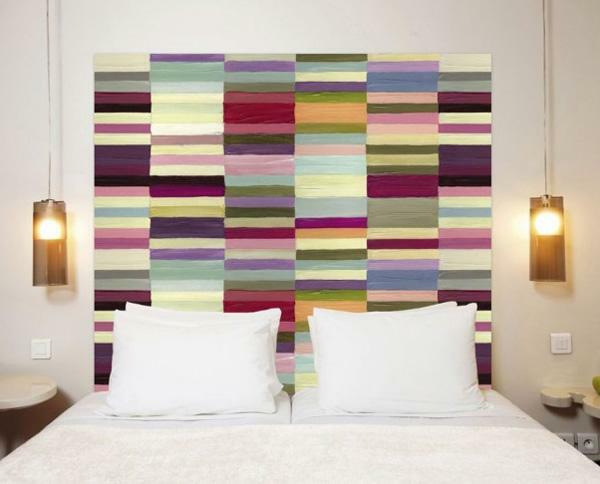 Colorful panel headboard. The various colors on the headboard make it look really fun and interesting. It also helps make the room wider and neat. Beautiful guitar inspired headboard design. The shape and the style of the headboard is shaped and drawn as that of a peacock’s tail but with guitars grouped together to form the shape. 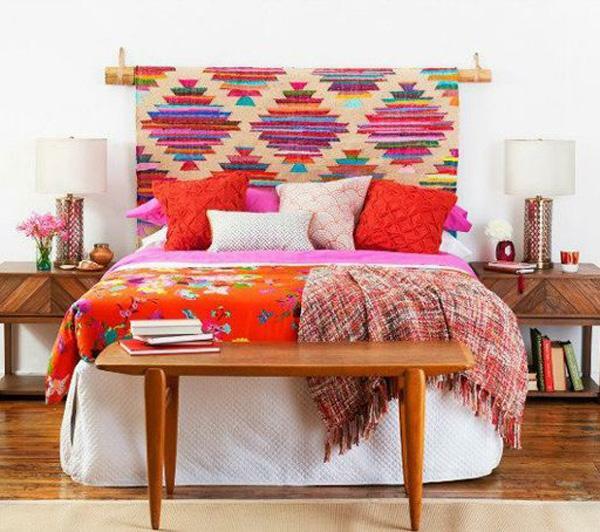 Tribal inspired headboard. The colorful design on the headboard resembles that of a mat and looks very traditional, perfect for vacation homes and room designs where you want to feel the tropical air. Majestic looking headboard. 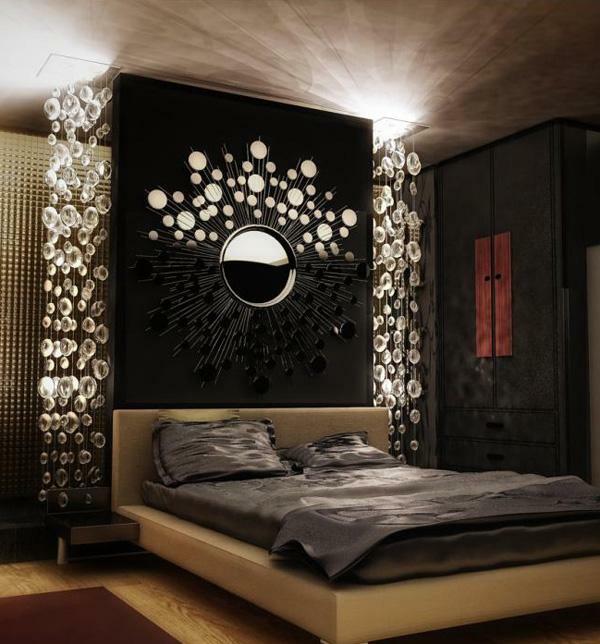 The simple wooden headboard is attached to the majestic matte black design with several mirrors attached to it and it simply looks astounding. A really cute paper cut-out inspired headboard. The design is simple yet very cute to look at. It is perfect for a children’s room or a girl’s room because of the design. 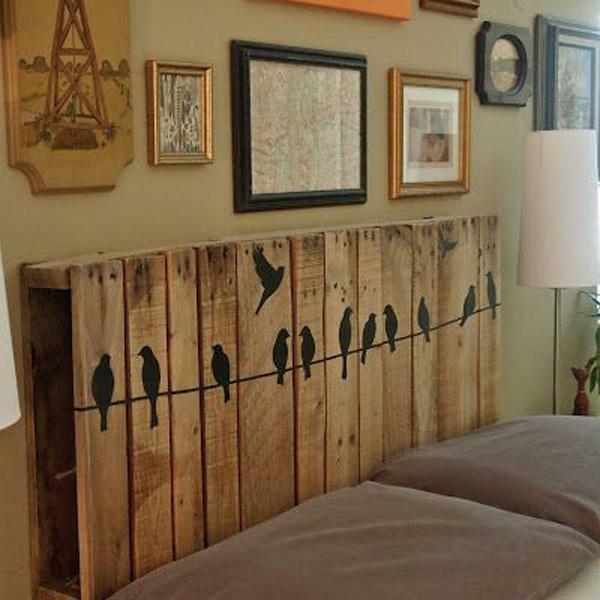 Rustic themed headboard. Everything on the headboard is made out of wood and to complete the effect, silhouettes of birds on a wire have been hand painted on the front.